Nestled against the Snowy Range Mountains in the Centennial Valley west of Laramie, Wyoming, Deerwood Log Homes specializes in constructing custom, handcrafted log homes and commercial structures. 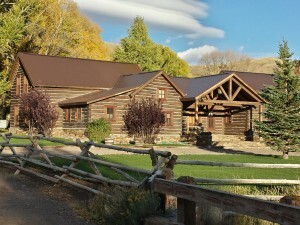 Deerwood Log Homes began in 1990 as a two-man residential log construction business. Growing demands for log structures led to specializing in custom homes and small commercial structures. Due to local demand for high quality construction, Deerwood now creates homes using traditional construction, timber framing, post & beam as well as log construction. Here at Deerwood Log Homes, we take our cues from nature to create a custom and unique log home that, like the trees with which we work, blends into its surroundings, one more unique piece of the eloquent whole. The idea of a custom-designed, handcrafted log home is nothing new. In fact, it was Swedish immigrants who first brought the old-world traditions of hand-scribing and saddle-notching to the Centennial Valley – the same techniques we still use at Deerwood today. Our craftsmen are not only specialists in their fields, each is also experienced in every phase of construction to assure precise attention to detail for every facet of a home. We like doing things the old fashioned way, building on traditions of craftsmanship and quality developed and perfected over generations. At Deerwood, we incorporate innovative architectural details to suit each customer’s individual needs. The most important reason we pay so much attention to the unique design of each and every home we build is you, the customer. We want your home’s individual personality – created from a synthesis of natural materials with their natural environment – to reflect your own. Deerwood Log Homes . . . Designed by Nature, Built by Hand.